In a previous article on this subject (February 21), I proposed that a Nigerian people’s manifesto at this particular critical time in our country’s history should have a double character. It should be, in the first place, a Nigerian Left’s manifesto in the ordinary sense of the term: “a public declaration of intentions, motives or views” or a “public statement of policy or opinion”. In the second place, it should be a Nigerian people’s charter of demands drafted and put out by the Nigerian Left in the name of the Nigerian people, where “people” is here used in the ideological and sociopolitical sense to refer to the popular masses. For antecedents from the recent history of popular struggle in Nigeria, check out the charters of demands put out by the Nigeria Labour Congress (NLC) and National Association of Nigerian Students (NANS) in the 1980s. Should a formula be considered appropriate and useful we can say that a Nigerian people’s manifesto is the Nigerian Left’s public declaration of its agenda plus a Nigerian people’s charter of demands. A people’s manifesto can thus be used for elections (as a platform) and for general popular struggle. It should be a clear and concise statement: concrete (as against abstract), unambiguous on any issue, drawing inspiration from the history of our own struggles as well as popular struggles outside our borders. Before coming to the minimum objectives of a people’s manifesto at this point in our history we may again look at issues that spring at the Left—the protagonists and expected authors of the declaration. These include the identity of the Left, that is, who they are; the country we now have and the country we wish to have (adapting the language of a world-historic African Marxist, the veteran public intellectual, Samir Amin); citizenship, fundamental human rights and directive principles of state policy (adapting the language and contents of chapters II to IV of the Nigerian Constitution, 1999); national unity, federalism and popular – democratic restructuring; popular re-deployment and redistribution of national resources; character, functions, control and deployment of Nigerian state institutions; immediate steps (on pressing needs and current crises). This list can be extended indefinitely. It can also be shortened to five main items under which everything that ought to be included finds a place. What is important is to be able to identify the fundamental, the strategic, the critical and the immediate from a long, or even indefinite list, or to distill same from a short or condensed list. 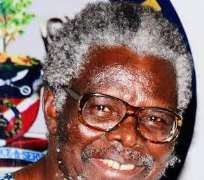 For instance, the ongoing anti-corruption campaign, though important and supportable, is not strategic—or to use the late Comrade Professor Eskor Toyo’s formulation, it is not central. What is strategic or central is the popular-democratic redeployment and redistribution of national resources. Redeployment and re-distribution from where and to where? From predators and state-robbers to the victims, the popular masses. The people’s manifesto should be a manifesto of struggle. In this sense it should be aimed at achieving or creating the conditions for achieving three minimum objectives within a specified period. The first objective is to concretely ameliorate the harsh material lives of the popular masses and the conditions under which they reproduce these lives. The second is to strengthen the unity of the popular masses and the fighting ability of their organisations. The third is to prevent Nigeria’s ruling classes from plunging the country into another civil war through their internal struggles and their irresponsible use of state institutions against both themselves and the popular masses. Of the issues earlier listed for inclusion in the people’s manifesto, the question of structure of national unity may be considered as currently dominant. This is not just because the issue is fundamental and has deep historical roots, but also because that is the issue on which factions of the ruling classes and several non-ruling groups are currently engaged in a bitter struggle. And it is here that the Nigerian Left should boldly and clear-headedly step out with historical and moral authority and proffer a solution. One possible solution-and the one I have written and talked about for a fairly long time and which will soon appear in a book form – is restructuring under poplar democracy or popular-democratic restructuring. I wish to affirm the historical and moral authority of the Nigerian Left on the issue of national unity by means of a series of propositions. One: The only ideological tendency that stood consistently for national unity until the outbreak of the civil war in 1967 was the Nigerian Left. Two: The split during the (1967-1970) civil war of the Nigerian Left into the Nigerian Left, the Biafran Left and the unviable but historically correct middle-position was imposed by circumstances largely beyond the control of that generation of Leftists. Three: During the civil war the Nigerian Left and the Biafran Left gave huge and critical support to the Nigerian regime and the Biafran regime respectively. Four: In spite of the huge and critical support given by the Left on both sides of the divide, the Biafran Left suffered repression during the war while the Nigerian Left suffered its own repression immediately after the war. The fifth proposition is this: Since the end of the civil war the re-united Nigerian left has stood for the unity of Nigeria. Six: The Nigerian Left’s commitment to national unity has remained inseparable from its commitment to people’s power, popular democracy and socialism. Seven: The history of Nigeria and the history of the Nigerian Left, from the colonial time to the present, have shown that national unity alone – that is, national unity separated from people’s power, popular democracy, socialism and, now, the structure of that unity - is too narrow to be a basis for alliance between the Left and any other ideological or political tendency. These notes may be concluded with a sketch of what I mean by “restructuring under popular democracy” or “popular-democratic restructuring”. The sketch has two parts: popular democracy and restructuring. Joining them in the way I have done and against the background of what has just been said simply means not only that for the Nigerian Left the campaign or struggle for restructuring cannot be engaged outside the framework of the struggle or campaign for popular democracy but also that each part implies the other and that at this point in our history they are inseparable and mutually re-inforcing. The “popular democracy” segment is familiar enough to be left out of this small space. But there are five parts or levels in the “restructuring” attached to it. Starting from the top, there is the federation. Below it are eight regions or geopolitical zones derived from the present six zones by the splitting of each of the present Southsouth and Northcentral zones or regions into two. Below the eight regions or zones are the present 36 states and the federal territory. Below this level are the present local government areas. And below the local government areas are the neighbourhoods or communities coterminous with the present local government wards. The powers and functions of governing institutions at the various levels will be as proposed in my forthcoming book and in my piece, Leftists in electoral politics (The Guardian, January 15, 2018). But this bit may be inserted here: In place of the present executive president, the restructured federal system will have an 8-member presidential council made up of a member from each of the 8 geopolitical zones. Members are equal; headship and vice-headship are rotational; and each tenure lasts 6 months. Hence, by the end of a 4-year tenure of a presidential council, each member would have served as Chair for 6 months and Vice-Chair for 6 months.